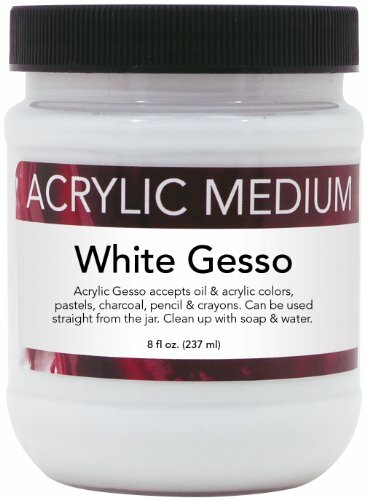 Gesso is an important studio staple for any level of artist. 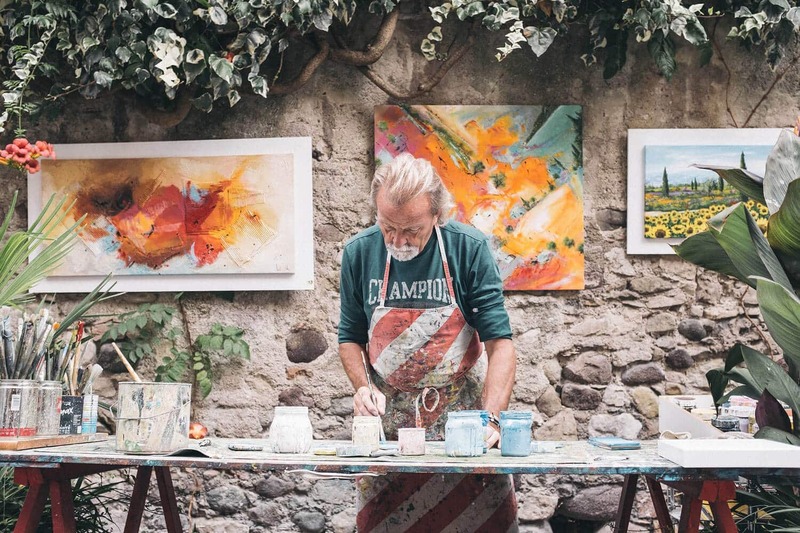 Whether you are just starting out or are a professional artist, a few layers of gesso to any traditional or non-traditional surface be it canvas, wood, metal, etc. 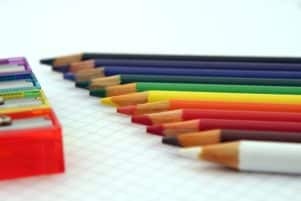 will allow both acrylic and oil based paints to latch on with complete ease. But gesso is more than just a primer that is applied prior to painting. When applying a few coats of gesso to a surface and then lightly sanding it down, it can create an incredibly toothy surface that will allow you to have greater control over your paint as an artist – like the Liquitex Professional Gesso. Applying gesso to your canvas and then smoothing it out will allow you to be able to paint the detail areas of your artwork with absolute ease. But in order get the best results, you must use a quality gesso. Here’s a comprehensive list of some of the very best gesso’s that painters have recommended time and time that really showcase their work in the absolute best possible light. Liquitex Professional Gesso ***** $$$ 16 oz. Grumbacher Gesso **** $$$$ 16 oz. 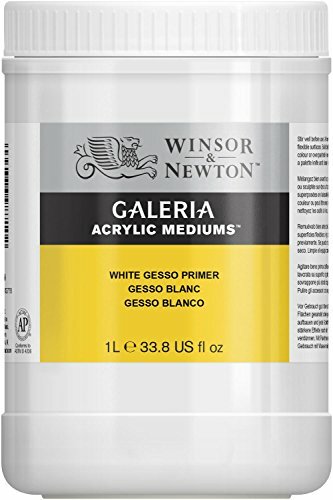 Winsor & Newton Galeria Acrylic White Gesso **** $$ 33.8 oz. 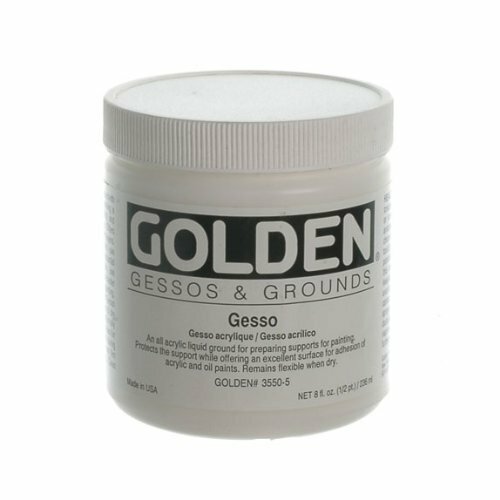 Golden Acrylic Gesso **** $$ 8 oz. Handy Art Acrylic Gesso *** $$ 32 oz. Art Advantage Acrylic Gesso *** $ 8 oz. While normally we would always recommend student grade art materials to beginners, gesso is the only exception to this rule. The Liquitex lineup of gesso is not only affordable, but comes in a wide array of options allowing to you get just the right one for the type of artwork you plan on painting. But beyond their impressive size options (10 total), you also can get the gesso itself in a variety of colors. …and that would be a fair guess. However, for those artists looking to paint on glass or perhaps wood, a clear coat of gesso not only will allow your paint to stick with ease, but it will showcase the beauty of the raw material beneath the gesso itself. Liquitex gesso is non-cracking and doesn’t yellow as time wears on, making it preferred among professionals for the amazing archival qualities. But beyond just color and size, Liquitex also offers their gesso in a variety of weights. While we are focusing on just their plain gesso today, know that they do offer a ‘Super Heavy Gesso’ and ‘BASICS gesso’. Super Heavy is perfect for adding depth to your painting by generating enormous peaks and valleys while the BASICS gesso is well suited for student or classroom use. If there were ever a brand name that is synonymous with gesso, then it’s definitely going to be Liquitex. 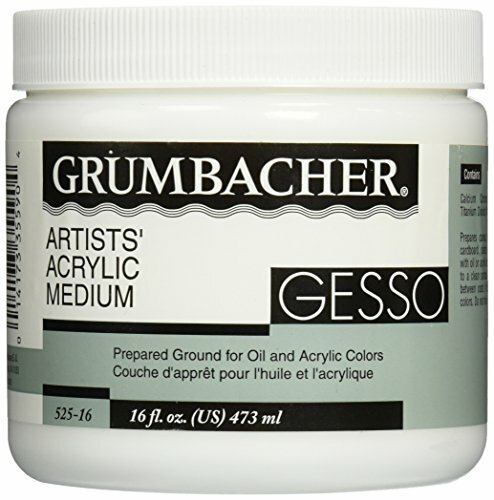 While Liquitex may be the first brand that artists think of when they hear the word gesso, a close second to them will be Grumbacher. A trusted art supplier since 1906, Grumbacher makes their gesso right here in the USA. 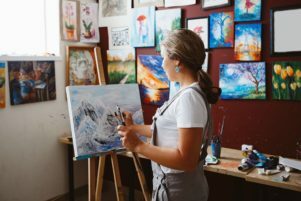 This Leeds, Massachusetts based company offers a wide array of acrylic mediums including transparentizers, varnishes, mattes, paste, and of course, gesso. With the ability to be used on just about any surface, once applied, the thick Grumbacher gesso will provide a matte-like surface that will be free of any gloss whatsoever (a common problem when dealing with some other gesso’s). Secondly, the drying time of this gesso, given that it’s an acrylic base as opposed to oil will be rather quick (under 20 minutes). 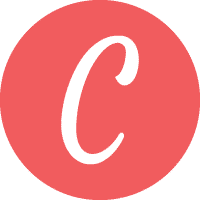 This allows you to not only apply a coat to your canvas relatively quickly, but it will allow you to get on to the more important things, like painting. As one artist pointed out, the Grumbacher gesso does included calcium carbonate in the container (i.e. marble dust). This helps it to provide a much greater tooth to the surface that ultimately will yield you better results. UK based company Winsor & Newton, primarily known for their fine oil and acrylic paints has an outstanding acrylic gesso that student and professional artists absolutely love. As great as the Winsor & Newton gesso may be, it equally has an affordable price tag that even rivals some of the student offerings we looked at. With such a high pigment concentration and a quality acrylic resin that is important in ensuring that the gesso sticks to the surface that its being applied, the Winsor & Newton gesso will be able to provide consistently reliable results every time you use it within your studio. One art supply company that brings a lot of clout to the world of paints and mediums will be Golden. With the ability to deliver a bit more flexibility when dried, the Golden gesso is perfect when applied to a stretched cotton canvas that isn’t nearly as taught when compared to a linen canvas. Based on artist feedback when drafting this article, we learned that many professionals that like to paint on aluminum or other metallic surfaces found that the Golden gesso performed the best – especially when 4 coats were applied in differing directions. The amount of tooth that is provided by the gesso will allow even the best kolinsky sable brushes to really shine when they run across the surface. Like other gesso’s reviewed in this article, Golden does offer up their product in a variety of sizes and consistencies. So, if you are looking for a clear or even black gesso, they should be able to suit your needs. Maker of non-toxic glues, gesso, paints, and more, USA based Handy Art has been serving up art products since 1974. 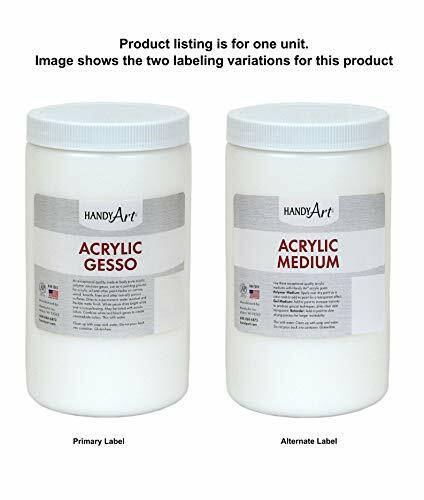 Like many of the gesso’s we reviewed, Handy Art’s products are also non-toxic and conform to ASTM D 4236. Providing a smooth matte finished when applied to any surface, Handy Art’s gesso will allow the paint loaded onto the end of your brush to grip with ease. With a 32oz container, the Handy Art gesso is among the best valued gesso on our list – making it terrific option for artists who are watching their budget. However, for the professionals that want a bit more from a gesso, as we eluded to just a minute ago, their Designer’s Palette series has received high marks and currently has a perfect 5.0 rating on Amazon (at the time of publication). The Designer’s Palette will come not only with a higher pigment concentration, but a thicker consistency which will ultimately allow for a much more receptive texture – especially key when composing your painting. This thinner, yet non-yellowing gesso by Art Advantage is another great gesso for those artists out there on a restricted budget or are attempting to use this medium for the very first time. Available in white, grey, and black, you can select the best gesso for the project at hand. But one of the features that we really loved about this gesso and the reason why we included it on our list was its incredibly quick drying times. 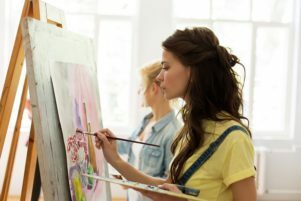 Unlike some of the other heavy or thicker gesso’s mentioned in this article, you can expect the Art Advantage to be dry to touch within a few minutes. Of course, given that this is a bit more of a budget brand compared to some of the others listed, based on our research we found that some artists found consistency issues. However, on the whole, most artists were pretty happy with what Art Advantage was able to offer at such an extraordinarily low price. And like all gesso’s, given that this is an acrylic base, soap and water will be able to clean your hands in no time.